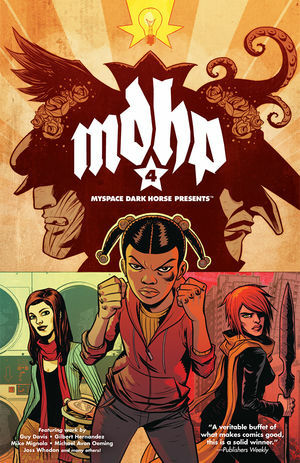 The third volume of the online comics anthology MySpace Dark Horse Presents digs deeply into Dark Horse's broad range of genres and iconic characters, including Stan Sakai's award-winning Usagi Yojimbo and Joss Whedon's Buffy the Vampire Slayer and Dr. Horrible. Mike Mignola plucks a character from the backdrop of his Hellboy mythos with the debut of Witchfinder, and Dark Horse presents the first new Creepy stories since that legendary anthology ended in 1983. Dark Horse also demonstrates its commitment to webcomics with the hit online strips Achewood, Applegeeks, and others. * MySpace Dark Horse Presents is a free online anthology that provides fresh content the first Wednesday of every month. To find out more, check out: www.myspace.com/darkhorsepresents.